Have a look at our Gwen REPL in Action. No Page Objects – There’s no long way to go. We’re already there! Source: No Page Objects – There’s no long way to go. We’re already there! There is so much more that can be automated with Gherkin. 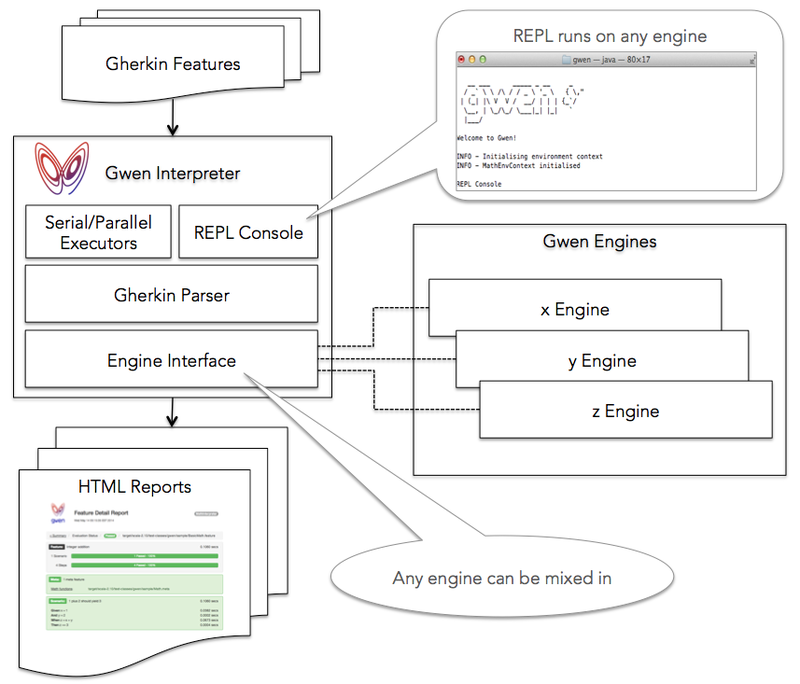 In the previous post, I announced the open sourcing of the gwen-interpreter project. In this post I will introduce the interpreter and evaluation engine concepts and describe the difference and relationship between them. The Gwen interpreter translates Gherkin features into executable code. The code that each step is translated to is not defined in the interpreter itself, but rather in separate modules called evaluation engines. When a feature is executed, the interpreter delegates the processing of each step to a mixed in engine that you define or provide. This is necessary since evaluation varies across systems and it would be futile to try and code for every conceivable behavior in one implementation. For this reason Gwen abstracts the evaluation engine to support many implementations. In this way, you decide which engine to use based on the type of system you want to evaluate. For example, if you want to evaluate the behavior of a web application, then you can use our web engine. Each engine must prescribe a DSL and use at least one API to interact with a target system. Engines can be defined to replicate any software process that is reproducible through one or more API’s. There are many useful engines that can be built and they need not all be confined to just testing. Engines can be defined to automate, emulate, or simulate any process that is repeatable through software. Engines can also be built to generate data and other resources too. The interpreter reads Gherkin features and dispatches the processing of each step to a mixed in engine. Engines define the DSL and processing to create conditions, perform actions, and assert expectations on target systems. Hopefully many engines will emerge from the community and be shared. One platform for many types of automation. Gherkin is a language for describing software behavior. Any software behavior. It makes sense to use it for evaluating software behavior too. But how can one evaluate any software behavior against any system with the one language? A common language interpreter with an abstracted evaluation engine could be one way to do it. This interpreter would accept Gherkin features as input and produce executing instructions as output. Specialised engines with specifically prescribed DSLs could be built and mixed in. The interpreter would support sequential or parallel execution. It would also produce evaluation reports and have a REPL console. It would provide all the necessary processing and tooling required to interpret Gherkin features and execute them. A public library of engines would emerge and be shared for everyone to download and use. The one interpreter would work with all of them. It’s a simple idea that a colleague and I have been working on. We wrote it in Scala and open sourced it as a project called gwen. Imagine writing entire programs by coding only what is necessary. Now create an abstraction for that. There was a time when OO was considered king. Those days are over. FP is leaking into every modern JVM language and the functional programming community is pushing boundaries. This has introduced new challenges for traditional Java programmers. We need to learn some FP. One way to ease our way into learning FP is to learn some Scala. The expressive power of functional programming quickly becomes apparent when you learn to use map, flatMap, filter, and friends. But then, just as you begin to feel comfortable with these, someone comes along and utters the phrase “flatMap on the monad”. flatMap on the what? They try to explain, but it goes over your head. You think nothing of it and move on with learning more FP. But before too long, you stumble upon a random blog somewhere where someone is raving about “the Maybe monad”. There’s that ‘M’ word again! It seems that the entire FP community knows what a monad is, but you do not. You try to read along and follow, but struggle. You tell yourself to think harder and read again. You struggle again. At this point you can choose to either keep going round in circles or put aside everything you think you know about FP and start learning it. After about two years of going back to basics and studying up on some programming history, lambda calculus, logic, a little bit of math, and experimenting with OO and FP, I believe I have finally got it! It has perhaps taken me a lot longer than it should have, but I wouldn’t change a minute of it. If you’re interested in seeing monads in Java, this might be for you! Here we are using the standard Java naming conventions for types. This is a function that accepts a parameter of type T and returns a result of type U, commonly referred to as: “a T to U function”. Pure functions produce output based on input and do nothing else. They always produce the same output for a given input, do not modify any state, and produce no side effects. They are known to be what is termed ‘referentially transparent’, which means that for a given input, you can replace a function with its output throughout a program without impacting behavior. Achieving referential transparency with Java will require some discipline on our behalf, since most data structures are mutable. You may have noticed that the apply method in the Function interface does not declare to throw any exceptions. This was done deliberately in the interest of preserving referential transparency. That’s right, throwing an exception is considered a side effect. Unfortunately there is no escaping checked exceptions in Java, so you will need to handle any checked exceptions that may occur in your functions (tip: do not throw checked exceptions). Runtime exceptions on the other hand are legitimate errors that we will treat as failures (tip: do not use this as an excuse to wrap and throw checked exceptions in runtime exceptions). This is a function that maps a T -> U function to a F[T] -> F[U] function. (We use square brackets instead of angle brackets to denote parameterized types to avoid confusion with the functional arrow syntax). You can think of fmap as either a function that maps over a function, or as a function that lifts a function. Either way, it provides a means of applying a function to a value in a functor through a wrapper function. We will define Functor as an abstract class instead of an interface so that we can restrict public access to fmap (later on we will implement a public method at the monad level called map which will implicitly apply fmap to the current instance). Type F is the parameterized type of the functor. A concrete implementor can pass itself or a generic type that it implements in as this type. Types T and U are the input and output types of the function argument f in fmap. T is provided as a parameter and U is inferred by the compiler. Let’s go through an example to get a feel for how fmap works. Imagine that you have a functor that is a box with a value in it that is not accessible from the outside. The box has no getters or setters, only the fmap function. How do you apply a function to the value in the box and get another box with the result of the function in it? The solution is to create a function that can be applied to the value and then apply fmap to that to get another function that when applied will return the new box. So now that we have functions and functors, let’s move on to monads. We now introduce a function called join to flatten the lifted output of fmap(f)(mt) back down one level. Remind you of anything? Hey yeah, it’s flatMap! So that’s what that “flatMap on the monad” thing is all about! To simplify our Java implementation we will make the join function a parameterless method that can be called directly on a lifted M[M[U]] result. The unit function will lift both values and functions into M. It will lift values of type U to M[U] and values of type M[U] to M[M[U]], and functions of type T -> U to M[T -> U] and functions of type T -> M[U] to M[T -> M[U]], and so on. This is the signature of what is known as an applicative functor. It takes a function in M and applies it to a value in M and returns the result in M. It effectively just applies a function in the context of M. This is exactly what fmap will do for all monads. So we can say that all monads are applicative functors. We’ll now create an Applicative type class to capture this in a function called apply. Note that apply also calls unit to lift the result of f. So unit is used twice in every function application; once to lift the function and once again to lift its result. Currently, the function returned by fmap unconditionally invokes apply to yield a lifted result. To give individual monads the opportunity to override this, we will move this logic into a new function called yield and have fmap call that instead. Individual monads that wish to skip over functions and yield their own results can do so by overriding this default yield implementation. Notice here that if yield is overridden, then apply will be bypassed. In a bind scenario, join would then no longer be guaranteed to receive a lifted result. For example, an overridden yield could skip over a function and yield the enclosing monad instance as the intended result. In this case, join would be called on a non lifted value of type M[U] that it would not be able to flatten. Therefore, if yield is overridden to return a non lifted result, then join must also be overridden to return that same result (the same instance that join is invoked on). Otherwise join will error. We said earlier that we would treat runtime exceptions as failures. So we will introduce one last function called fail to give monads the opportunity to deal with failure in their own way. This function will accept a RuntimeException and return a value of type M[U]. The default implementation will simply rethrow the runtime exception. Monads that wish to introduce their own failure values can override this function. We now have everything we need to define a monad base class with concrete and final implementations of fmap and apply, default implementations of map, bind, yield, join, and fail, and two abstract methods; unit and get. We can now extend this base class to define specific kinds of monads. Subclasses need only implement unit and get (inherited from Applicative), and override yield, join, and fail where necessary. For stronger type inference, subclasses can override map and bind and change their return types to match the subclass type and delegate to super.map and super.bind respectively. Now that we have a class for building monads, let’s build one. An easy one to start with is the Maybe monad. A Maybe monad is a container for a value that exists or does not exist. That is; it contains just one value or it contains nothing. The Maybe base class overrides fail to return Nothing. It has an instance factory method that accepts a value and returns a new instance of Just containing that value if it is not null, or a Nothing otherwise. Both Just and Nothing extend Maybe and implement unit. Nothing additionally overrides yield and join to return itself (which is Nothing). If you map or bind on Just, you will get a new Just with a value. If you map or bind on Nothing, you will get back the same Nothing. How is this useful? It’s best to illustrate with examples. This is neither ideal nor sufficient, as the final result in the email result could still be assigned null. Let’s lift the bank object and all properties into a Maybe monad and use bind. To reduce the redundancy associated with writing anonymous inner Function classes, we’ll write a Maybe getter utility function (one that delegates to the standard getter function we created earlier). Solved! We now have one Maybe result, and no nulls to worry about. That’s right, they don’t exist anymore. A null property anywhere in the chain will resolve to Nothing and propagate to the result as Nothing without invoking any getters below that point in the chain. This is because our mgetter function lifts every property through the Maybe.instance factory method which returns Nothing if given a null, and a Just otherwise. In the happy scenario, the last bind will return Just(email) as the final result. result = new java.math.BigDecimal(0); // undefined value = 0 ??? Having to handle runtime exceptions like this is really bad, but what makes it terrible is the fact that the failed result of zero is misleading. The reciprocal of zero is definitely not zero! If we instead execute the division inside a Maybe monad, we can do away with the error handling and always get a meaningful result. Now we’ll get a Just containing the result if num is non zero, or a Nothing otherwise. A guaranteed meaningful result either way. How does this work? Maybe overrides fail to return Nothing, and fmap calls fail whenever a runtime exception occurs. Let’s build another monad; the Either monad. Either is a container for a value that can have one of two types. One type is called Left, and the other is called Right. The common convention is to use left for failure values and right for success values, but you can use them to represent any two types of values you like. We will define an Either interface that accepts two type parameters L and R (for left and right respectively). We will extend Monad and implement the Either interface to define a new class called EitherMonad that will be the base for Left and Right. This class will accept three concrete types; L, R, and T. Left will pass in [L, R, L] and Right will pass in [L ,R, R], partially applying L and R respectively through the Monad parameter T. This partial application is necessary since Monad only accepts one concrete type parameter. Both Left and Right implement unit, left and right. Left implements left() by returning the current Left instance and right() to return a new anonymous Right instance containing the current value. The anonymous Right instance overrides yield and join to always return itself. This is to ensure that a map or bind on Left.right() has no effect. On the other hand, a map or bind on Left.left() will return a new Left containing the new result as expected. Conversely, Right is implemented in the same manner. One use case of Either is to use it as an alternative to throwing exceptions. With this approach, a method that could fail can be defined to return a value of type Either instead of throwing an exception. Callers of that method are then guaranteed a result and can focus all their processing on either success or failure (right or left). A caller that is only interested in success can be completely oblivious to failure. If a failure does occur, it will bypass all operations and transparently propagate to the result and be ignored. If failure does not occur, all operations will execute without having to unnecessarily catch and ignore exceptions that never occur. Let’s consider an example that involves encoding and uppercasing a string that we know will never fail. This function will combine all elements in the list into a single value of type U. It will work from left to right by applying the operator to the original value z and the first element in the list, followed by applying it again to the result of that and the next element in the list, followed by the result of that and the next element, and continue in this manner until the end of the list before returning the accumulated result. yield, join, and reduceLeft will be implemented in terms of this function. This function will reduce all elements in the list to a single value of the same list element type T. It will also work from left to right applying the operator to the first and second elements, followed by applying it again to the result of that and the next element, followed by the result of that and the next element, and continue in this manner until the end of the list before returning the accumulated result. It will do this by reusing foldLeft. This function will return all elements in the list that satisfy a given predicate. This function will be implemented using bind. // List interface delegator methods..
// will return "The list monad rocks!" The list monad can also deal with failure. If any element in a list causes a function to fail, then the entire computation will fail and an empty list will be returned. There are many other things we can do with monads and many other monads we could go on to create. Now you may be thinking “What kind of Java programmer writes code like this?”. If you are, then don’t worry. Monads are FP abstractions. They are not well suited for non referentially transparent and imperative code. This and the lack of first class functions in Java makes them a very unnatural fit. Creating a type safe and user friendly interface with generic methods having bounded types is also difficult. The result is less than ideal type inference and code that is scattered with type annotation clutter. But I hope I have demonstrated the usefulness of monads or at least effectively introduced them to Java programmers who may be interested. I would suspect that anyone who is serious about transitioning from OO to FP will at some point find themselves going through a similar learning experience.